We had the good fortune to watch a close family member (congratulations to her!) take her turn as a torchbearer when the Olympic flame passed through Lincoln a couple of weeks ago. The atmosphere was second to none, as people lined the route to cheer on the torch’s progress and gathered in the City centre for an evening celebration and firework display. If that leg of the relay is anything to go by, the atmosphere in London in the final week before the Opening Ceremony will be electric. If you don’t have tickets for any Olympic events, this is your chance to witness a little part of the Olympic spirit. We’ve got the lowdown on the route that the Olympic Torch Relay will take each day, and details of local events that are happening to celebrate its arrival. Click the links below for more information. Our top tip for getting a great view of the torch, particularly if you are taking your children? Stand near a handover point. Each torchbearer carries the torch approximately 300 metres and then lights the next bearer’s torch. At each handover, one torchbearer arrives a few minutes in advance of the flame and this is a good chance to get some photos. 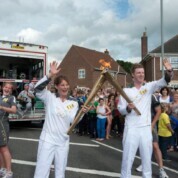 When the previous torchbearer arrives to light the next bearer’s torch, they both stand and pose for some photos with the flame for a few minutes. It goes without saying that you’ll get a better view if you avoid the busiest parts of the route (e.g. High Streets, town centres etc). Look out for the sponsors’ cavalcade which passes through about ten to fifteen minutes before the flame – they hand out freebies (inflatable clappers etc) to help you cheer on the Olympic torch.